First mentioned in a 1597 document but recorded as a resort in 1850, Sovata is located at 1,600 ft. above the sea level, in the stunning forested region of Transylvania, Sovata features the heliothermal Ursu (Bear) lake – unique in Europe. The mineral waters here are highly prescribed in gynecological and sterility afflictions. 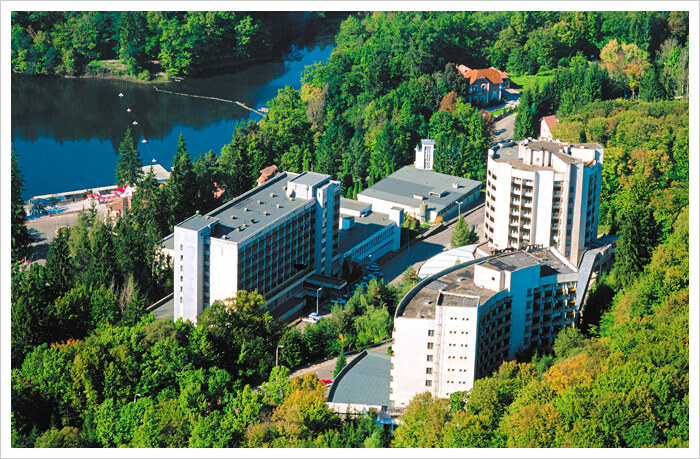 The nearby salt mine from Praid offers a suitable environment for the treatment of afflictions of the respiratory system, such as asthma. Elevation: 1,520 – 1,696 ft.
Transylvania is also home to the exquisite medieval town of Sighisoara, a perfectly intact 15th century gem with nine towers, narrow passageways and cobbled streets, burgher houses and ornate churches. A UNESCO World Heritage Site, Sighisoara is also the birthplace of Vlad Dracula, nicknamed Vlad the Impaler (Vlad Tepes), ruler of Walachia from 1456 to 1462. It was Vlad who inspired Bram Stoker's fictional creation, Count Dracula. His house is just one of many attractions here. Others include: the Church on the Hill, with its 500-year-old frescoes; the Church of the Dominican Monastery, known for its Transylvanian Renaissance carved altarpiece, baroque painted pulpit, Oriental carpets and 17th century organ; and the Venetian House, built in the 13th century. In the nearby countryside, another UNESCO World Heritage town, 13th century Biertan, stands high on a hill as one of the largest and most impressive medieval strongholds in Transylvania. The road that slices through the Bicaz Gorges (Cheile Bicazului) is among Romania's most staggering and spectacular. The gorge twists and turns steeply uphill for three miles, cutting through sheer 1,000-foot limestone cliffs on its journey through the mountains. For hikers, kayakers and fly-fishing enthusiasts, the Hasmas - Bicaz National Park's main attraction is the Red Lake (Lacul Rosu), created in 1837 after a major natural landslide. Short and long walks provide access to the lake's spectacular scenery and many fishing spots. The Bicaz Gorges offer a unique view of the Ceahlau Massif. Surrounded by watercourses and lakes, Ceahlau Mountain, the Olympus of Romania (it was considered to be the sacred mountain of Zalmoxis, the god of the Dacians), displays an incredible concentration of rare species and wildlife. Over 2,000 flower species, fossil limestone, the rock formations Dochia and Cusma Dorobantului, and the Duruitoarea Falls are some of the highlights of the park. From Targu Mures Bus Station (Str. Unirii 11) there is daily bus service to Sovata. Daily train connections from/to a number of Romanian cities, including Bucharest , Arad, Brasov, Sibiu. For Sibiu, Cluj Napoca and Sighisoara you must change trains at Razboieni. For departures from/to Targu Mures, please select Targu Mures (or Tirgu Mures).